Good morning everyone and surprise! It’s me Crusty T. Christian! Gary is taking a few days off and much to my surprise he asked me if I wanted to take the helm. Of course I said sure I’d love the chance but then I asked him if he was crazy for asking me without any formal theological training. He reminded me even though his “formal education” was limited his trust was in the tutoring of the Holy Spirit. There’s no doubt every one of us hasn’t at one time or another (maybe many times like me) done dumb things like belittling people, or some other thing people do to others or themselves that hurts everyone. But doing something dumb doesn’t make a person a dummy it only points out their dependency on God rather than things. Because God IS love there’s no such person as a “nothing person” every one of us is a “diamond in the rough” and if we give our lives wholeheartedly to God he will in his own time transform us from a lump of coal into the finest diamond in all the world. 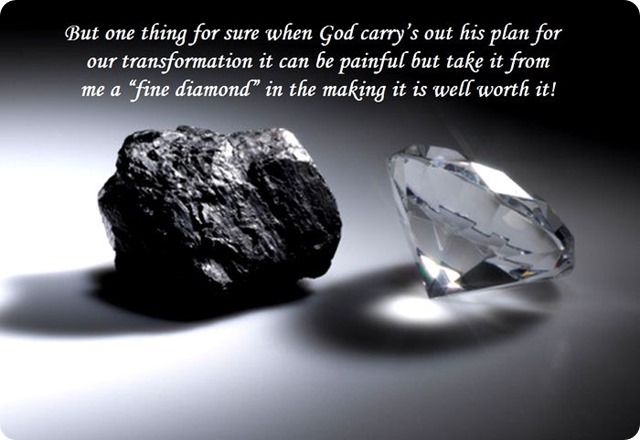 But one thing for sure when God carry’s out his plan for our transformation it can be painful but take it from me a “fine diamond” in the making it is well worth it! Walk in the Light with Jesus and you’ll never get lost!